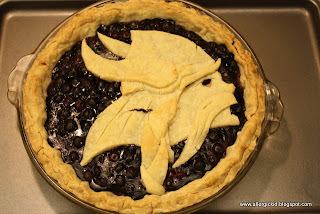 It's been far too long since I've made a pie for the monthly challenge from the creative bakers at You Want Pies With That? I decided there was absolutely no way I was going to sit out again in September. So I checked to see what fiendishly delectable theme had been chosen for this month, only to discover that Amy of Sing For Your Supper had selected football. The American kind with sweaty, grunting 350 lb athletes in helmets and shoulder pads? Oh, yeah, I was out of my league. I decided that if I was breaking out the rolling pin for a sport, then I was going to head home to my roots. I may be a Floridian now, but I grew up in Minnesota. For generations, my family's cheered the Vikes on to countless defeats. It's time to show some purple pride! Whiz up the flour and salt in a food processor. Cut up the margarine into little cubes, then send it for a spin as well. Add cold water by tablespoons until dough clumps up. Divide in half, shape into two discs, then cover in plastic wrap and stick in the fridge for half an hour. Combine water, sugar, corn starch, cinnamon and nutmeg in a small saucepan. Whisk until smooth, then place on medium high heat. Bring to a boil while continuing to stir. As soon as the mixture begins bubbling, remove from heat and place to side to cool. 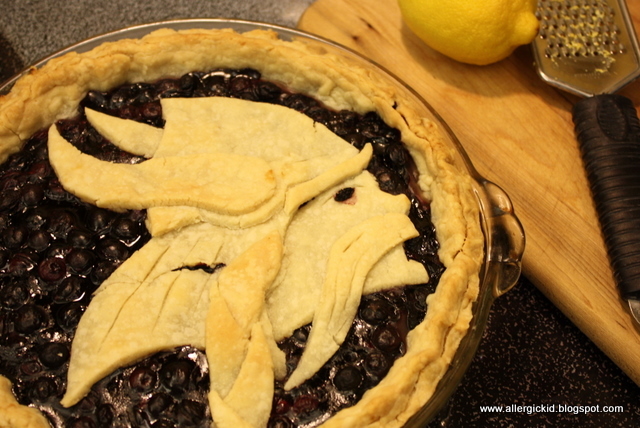 Mix into blueberries and lemon before pouring into crust. Place pie pan on a cookie sheet and bake at 425F for 15 minutes. Lower temperature to 350F and bake for another 35 to 45 minutes. Be sure to check out You Want Pies With That for what's likely to be the most original round up yet! It didn't help that they lost to the Saints again! Wow fancy! That is one impressive crust. 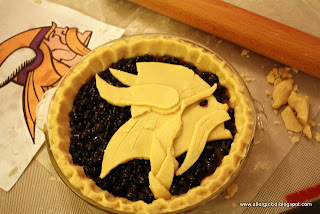 That's some impressive pastry art! And it looks tasty too! As a fellow Minnesota native and Vikings sufferer, er, FAN, I love your artistry! I'm inspired. Think mixing in lingonberries would work okay? Thanks for another great post. Elizabeth, I'm sure that lingonberries would work very well in the pie, and make it even more Scandinavian! (My King Arthur baking book lists them together in their little fruit pie chart.) I would dial back the lemon, though, and be sure to taste the filling to check the proportion of sugar. If you have a favorite pie crust recipe that works well for you, go right ahead and sub it in for the one I'm using, which has to be dairy free. Let me know how it turns out! What a creative and original idea for a topping. I took Randy Moss' arrival back to our fav team as an opportunity to try your great pie. It's not as photogenic as yours (and the crazy purple fans dug in quickly), but your recommendations were spot on (I did add a little more sugar). A YUMMY creation. Thanks much.